There's nothing that compares to the thrill and excitement involved in catching perfect fresh run Scottish salmon. This angler caught this fine fish during the month of April near the River Tummel junction on the River Tay. This area of the Tay system is a particularly potent Spring fishing area due to the Tummel's Spring salmon stocks. In Scottish salmon fishing it's important that you know where to be looking for a salmon and understanding where these different runs of salmon are to be found on the Scottish rivers throughout the year. As an example the lower River Tay is a fantastic salmon fishing area on the river during the late Autumn months however the middle Tay is a generally better area to be searching for Spring salmon during early Spring higher water levels. The above is why an understanding of these seasonal run patterns will get you closer to catching salmon along with other unseen factors such as 'rod pressure' and 'how' salmon are being caught. There's much more to deciding where the best salmon fishing venues are located than just looking at basic 'no detail' rod catch statistics which has always been a flawed measuring tool for determining how many salmon are present or moving through any Scottish river system. If you're coming to Scotland for a salmon fishing trip and you have a few days to fish it's always a good idea to spread the bet and visit a few different salmon fishing locations in the correct seasonal areas of the river. 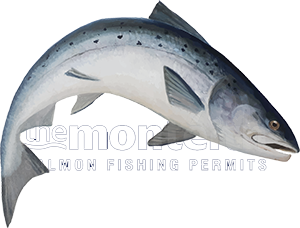 Building an effective salmon fishing itinerary depending on the timing of your visit requires good industry knowledge and experience via a reputable salmon fishing agent or professional salmon guide. If you take the proper advice on the timing and venue selection of your Scottish salmon fishing trip then Scotland has a globally leading salmon fishing experience in store for you. Your salmon fishing trip itinerary to Scotland can not only include different individual salmon fishing beat locations on the same river but can also provide access to different Scottish salmon river locations too.